Find a pallet storage facility near your area by joining Spacer today! 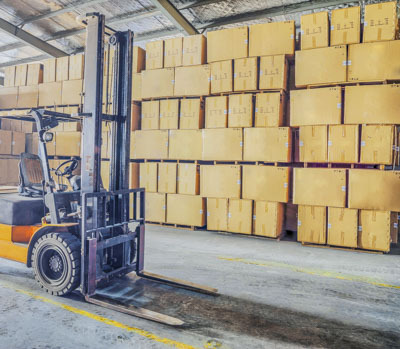 Whether you’re looking for a warehouse with pallet storage options, or you want to lease your own warehouse space that has a pallet racking storage alternative, we will help you find your best options. 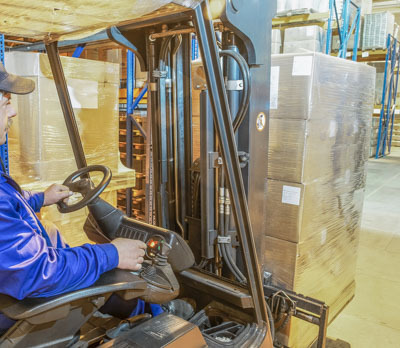 For people looking for nearby pallet storage, Spacer takes all the stress out of looking for one by setting you up with private warehouse spaces all over Australia. We currently have pallet storage options available in Sydney, Melbourne and Brisbane, and the list of available storage facilities with pallet racking spaces is growing every day thanks to Spacer hosts! As a host, you can make some extra cash each month with little effort. You could earn passive income for renting out your unused warehouse space. It’s a great way to make money and at the same time help your community by providing a necessary service. Pallets are the structural foundation of a unit load which allows handling and storage efficiencies. As a flat transport structure, a pallet supports goods in a stable fashion while being lifted by a forklift, front loader, crane or other jacking device. Goods or shipping containers are often placed on a pallet secured with strapping, stretch wrap or shrink wrap and shipped. Since its invention in the twentieth century, its use has dramatically supplanted older forms of crating like the wooden box and the wooden barrel, as it works well with modern packaging like corrugated boxes and intermodal containers commonly used for bulk shipping. Pallets are utilised to transport heavy and larger items. It provides a safe, effective shipping and storing platform and is also a cost effective way to move items around Australia. The Australian standard pallets are generally square hardwood pallets, often considered to be non-standard internationally. They are usually manufactured in Hardwood, but 1165 × 1165 mm pallets can also be manufactured using lighter timber. They have a load limit of 2 tonnes. 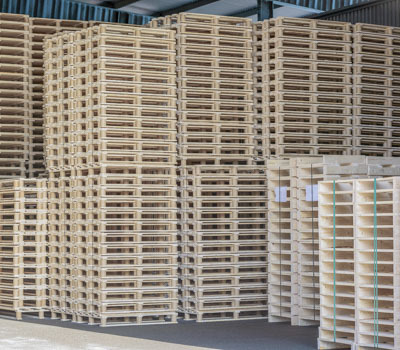 These pallets are extensively used in Australian storage and warehousing as racking pallets as they can be removed from transport directly onto warehouse racking for storage. Pallets are space savers. It eliminates the need for expensive shelving and conducting inventories of products or goods are made easier. They are usually stored in tall stacks to maximise floor space. The use of pallet is a convenient and smart way of utilising storage space, allowing for efficient warehousing. Pallets offer portability. hey are made of lightweight materials for effortless handling, making products or goods stored on pallets easily movable. As pallets follow one of several universal sizes and shapes, it makes them easy to lift and stack using a forklift or a pallet jack. Pallets protect the products. They are relatively stronger than other shipping containers like plastic wrappers or cardboard boxes. Shippers can stack heavier objects on a single pallet without worrying about the pallet breaking. Pallets also keep their contents up and off the ground. These ensure that the products are safe from standing water, dirt or debris. Pallets are cost effective. Because the standard dimensions of pallets and the containers are designed to fit into delivery vehicles making optimal use of space and palletised products can be moved more quickly, there is a faster turnaround of delivery. Lowering transportation cost while increasing operational efficiency. Pallets provides protection to products reducing product damage cost. High-quality wood pallets are also very affordable, durable and can easily be fixed or replaced. Make the most of palletisation by checking the best pallet storage to suit your specific storage requirements. There are different types of warehouse pallet racking solutions. These are single deep pallet racking, double deep pallet racking, block stacking, stacking frames, drive-in pallet racking, narrow aisle racking and selective pallet racking. The single deep pallet racking provides access to each pallet stored in the rack. When a pallet is removed the space is immediately available for a new pallet to be placed in that space. This type of racking can be configured in any number of ways with various heights. 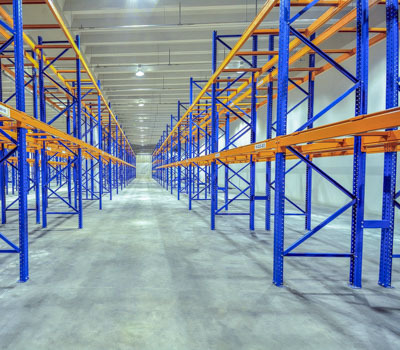 Though single deep pallet racking requires significant floor space for suitable aisles, most warehouses have this type of racking in use. The most cost effective method of bulk storage is double deep pallet racking. Whilst it does not provide selective access, the cube utilisation is much higher. Specially designed forklifts are required to place and remove these pallets from the racking. Double deep pallet racking utilises available headroom and a good access to stored stocks. Block stacking refers to unit loads stacked on top of each other and stored on the warehouse floor in lanes. The pallets are stacked to a specific height based on a number of criteria such as pallet condition, weight of the load, height clearance and the capability of the warehouse forklifts. The pallets are retrieved from the block in a last in, first out manner. 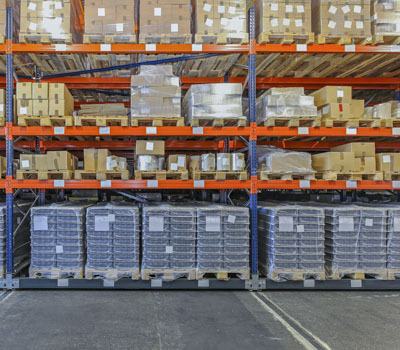 Block stacking is cheap to implement as it involves no racking and can be operated in any warehouse with open floor space. Stacking frames pallets are made up from decks and posts that can be erected and moved if necessary. The stacking frame allows pallets to be stored several high and is particularly useful when the pallets to be stored are not stackable. Many companies will use stacking frames in the warehouse when they need temporary racking during busy periods. Drive-in pallet racks are low on cost and big on high density storage. This type of pallet racking provides five to ten pallet load spaces similar to the double-deep racking. The drive-in lanes provide access for the forklift to place and remove stock, though due to limited space for movement, the time required to place and remove pallets is high. The drive-in pallet racking provides almost twice the storage capacity and follows the LIFO principle for pallet retrieval. ANarrow aisle racking system provides high density storage and good accessibility of stored products. It is also an excellent way of utilising floor space. 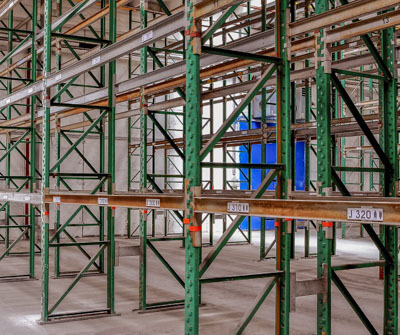 Though this pallet racking system typically increases the capital cost of the storage and materials handling equipment, it saves on space and building costs. Selective pallet racking is one of the most commonly used pallet storage systems .This type of warehouse pallet racking is the simplest in terms of equipment used and also the most economical solution in capital costs. The advantages of using selective pallet racking include better utilisation of available headroom, immediate access to any pallet, enabled stock rotation, and easy configuration. Palletisation is one of the most effective and efficient way of storing and moving products and goods. Whether you are experienced or a first-timer in pallet storage, we, at Spacer, have the storage solution to meet your needs. Easily find inexpensive and convenient pallet storage options on our list of spaces.